I really want to call this post “what Mary eats for lunch” and “how to prepare a week worth of lunches in less than an hour” or “bomb-diggity Asian-ish salad with ALL THE VEG IN THE LAND.” That third one would obviously be the best for SEO reasons (duh). But seriously, people have been asking “what are you eating now that you’re in school 40 hours each week! ?” and while I’m still kinda figuring that out, I have lunch DIALED. And breakfast, really. Dinner though: sometimes it’s chips/salsa/hummus. OOPS. I’m working on it! Today I’ll share my lunch approach, and Thursday I’ll share my breakfast/get more veg plan! GET READY! 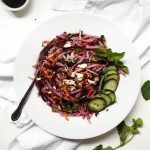 This salad has a few key elements (rice noodles, veg, sauce, herbs), a couple of accessories (nuts, black sesame seeds), and a ton of freedom. Choose whatever veg you want! Make a sauce that you like better! Add more goodies (nori, anyone?)! Swap almost for peanuts or cashews (neither of which I can have at school, hence the almonds)! Just make sure to make the VEG and HERBS (ok, and the sauce) the priority! Here’s the trick to preparing this in huge quantities in very little time: LE FOOD PROCESSOR! I’ve said it before, and I’ll say it again: my food processor is hands down the best kitchen appliance I own. I CANNOT recommend it enough. I have a decades-old Cuisinart that works like a champ! For this project I used the s-blade (kale, cilantro, mint), the shredder (beets, carrots), and the slicer (cucumber, green onions). The most essential is probably the shredder — it saves you the most time! I get all the veg sliced/diced/shredded before I do anything else. Get ’em nice and small! This makes for easy eating. You can cook the rice noodles while you’re doing this, if you want. I use the method of pouring boiling water over the dry rice noodles and letting them sit for 7-10 minutes (covered). I slightly under-cook them, because they’ll soak up some juices from the veggies/sauce when you pack it in the morning! 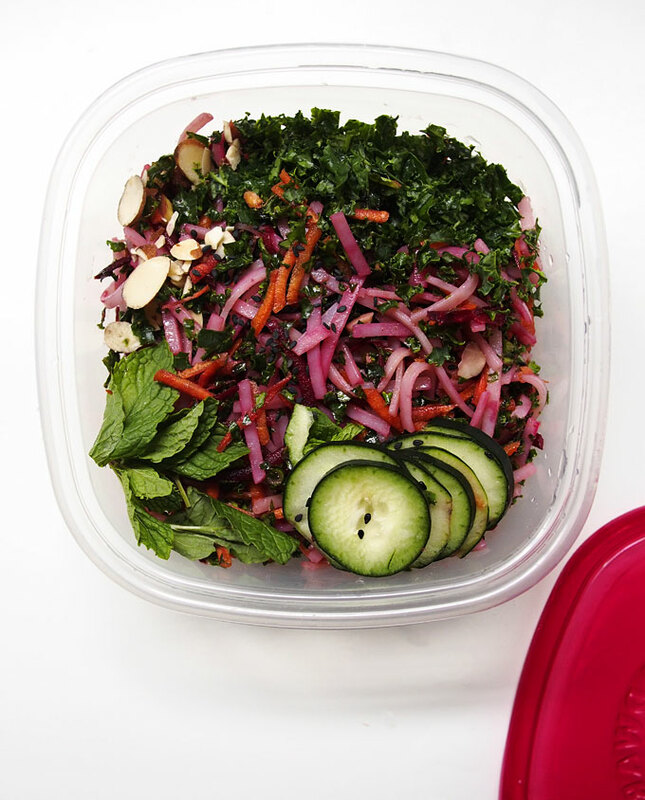 You could store all of the veggies separately, but I mix them together — when I pack my lunch, I take a scoop of rice noodles (which are in a ziplock with sesame oil, so they’re easy to pull out! ), a HUGE scoop (or two) of veg, plenty of extras (nuts, sesame seeds, cucumbers). I put the herbs in with the veg, just to make it easy. AND OF COURSE: add some sauce! I make a big batch, and pour in 2-3 Tbsp for each serving. Stick that in your bag and just TRY to make it to lunchtime without digging in! 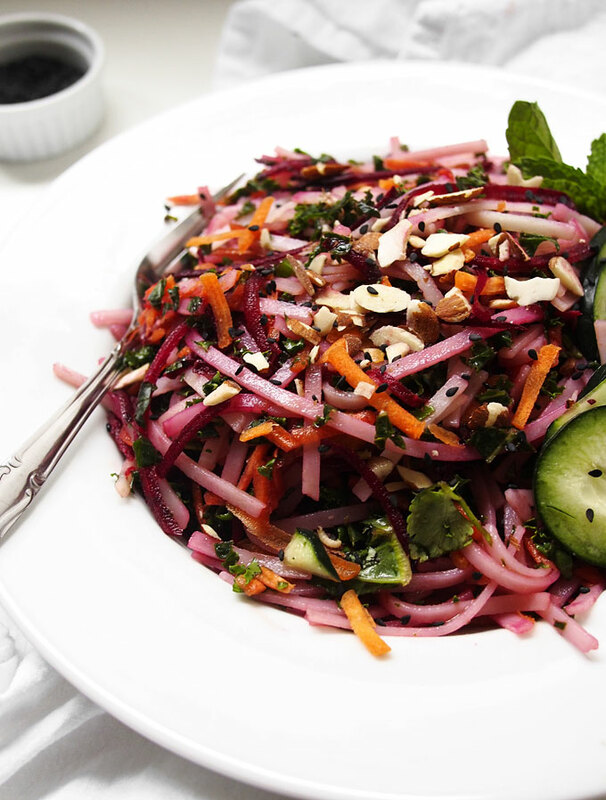 Quick, tasty, healthy, flavorful. That’s a darn good lunch, in my book! Stay tuned for what ELSE I’m eating, coming on Thursday! Whisk together all the sauce ingredients, and set aside. Bring 8 cups of water to a boil. Remove from heat and add the rice noodles. Cover, and let sit for 7 minutes. Test a noodle at 7 minutes, and cook until slightly underdone. Drain, and rinse thoroughly with cold water. Drain again, and toss with a tsp of toasted sesame oil. Set aside. Prepare the veggies in your food processor: remove the kale ribs, and use the s-blade to chop into fine pieces. Shred the carrots and beets. Slice the green onions and cucumber, and again use the s-blade to chop the cilantro and fresh mint. 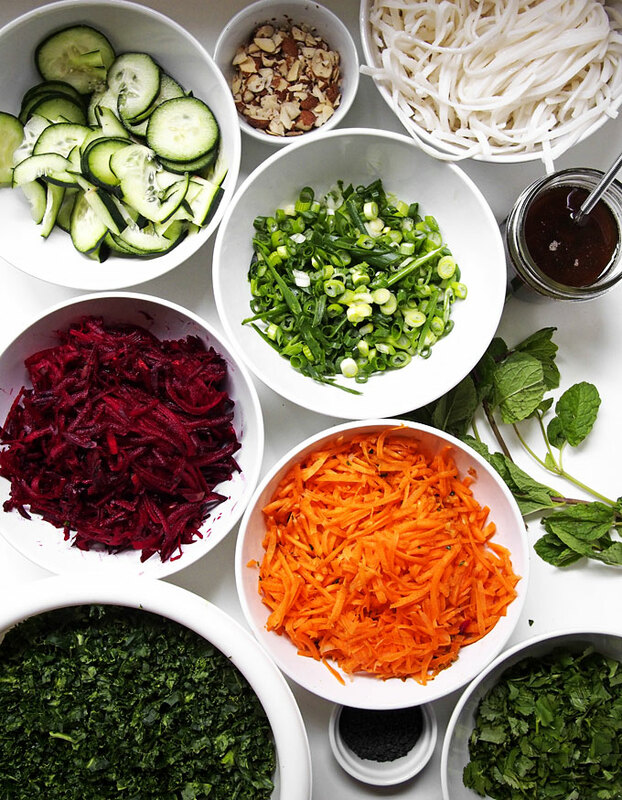 You can mix all of the veggies together, or keep them separated! 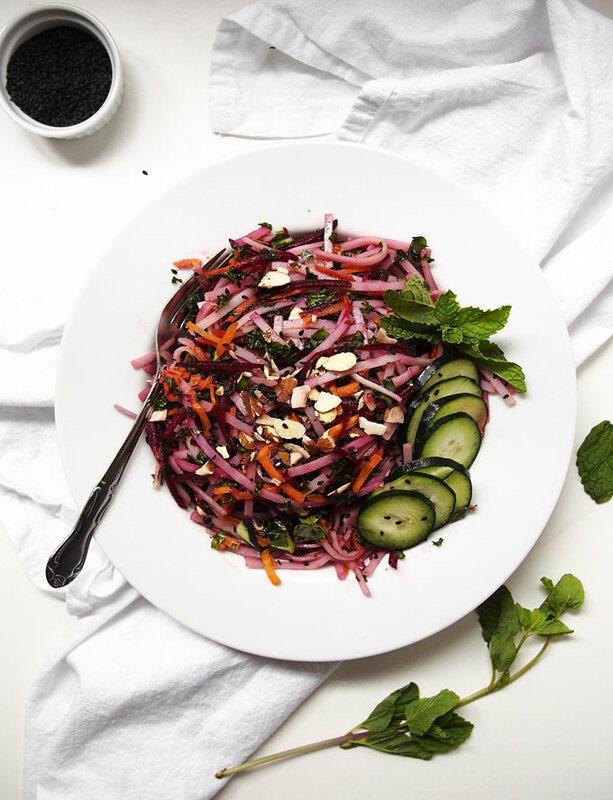 To assemble, take a large handful of rice noodles, a handful or two of the veggies, and top with a few Tbsp of sliced almonds, and a 1/2 tsp black sesame seeds. Mix it all together, and enjoy! 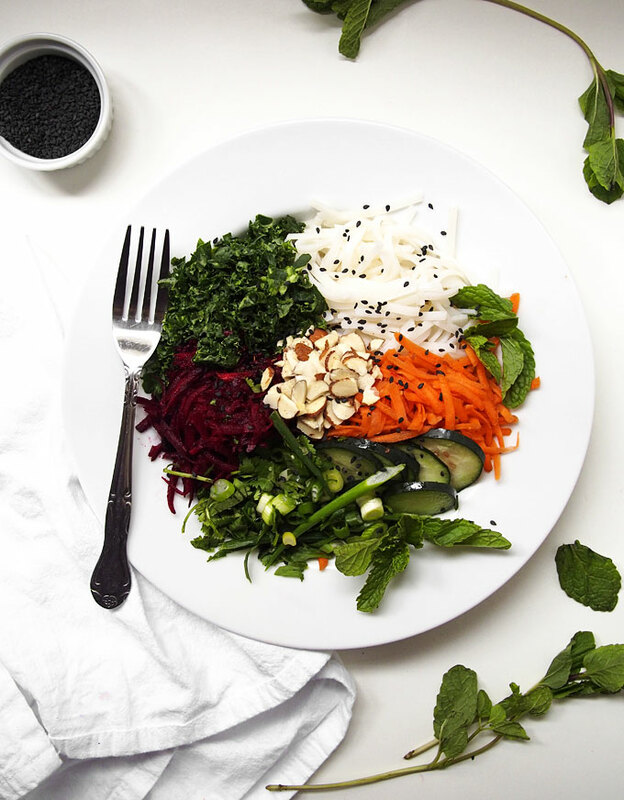 So much colour in this salad! And the rice noodles are a great addition. Yum! All the veg in the land! YES. This sounds like such a great way to make sure you eat a good lunch every day, even while really busy. You’re in code school now, right? I just went through my own code school experience in SF! If you ever want to chat or get some advice, you should definitely hit me up. Foodbloggers who code for the win! Just saw this posted on CSM! Good for you! YUM YUM YUM!!! I made this recipe on my son’s birthday party and people RAVED about it! I made it per your directions and it was wonderful. I even gave you credit for making me shine! THANK YOU!